Arthurian fantasy. #48, to be exact. As of this morning, the new edition of The Wrong Sword is up and active on Amazon, and for only $2.99! Some of you know I was a little concerned that all the positive responses from the prior incarnation of TWS wouldn't translate...but after some earnest conversation with Amazon, those lovely reader reviews have started popping up already. "Are there any changes?" you ask, half in fear, half in dread. "Have you become drunk with power, and tampered with the awesomeness that is TWS?" Fear not, Dear Reader - the only changes have been for the better. Like the new cover. Check that out, to the left. Snazzy, amirate? Also, for the very first time, there will be a print version of TWS, through CreateSpace, Amazon's print-on-demand arm. And in the weeks to come, TWS will make its way to Barnes & Noble, Apple, and the other major eBook outlets. There will also be some promotions and such on their way as I start to play with the indie-pub possibilities. If you're super-alert, you might have noticed that I've moved back to my real name, too. Not as euphonious, perhaps - but so much easier come tax day. WILL THERE BE MORE HENRY & EXCALIBUR? Answer: Yes. Yes, there will. I've got the sequel, Hero's Army, basting in my mental oven. How long it takes for that bird to cook all the way through, get all juicy and succulent, depends to a certain degree on how much people like the first one. The more folks buy TWS, the more incentive I have to focus on Hero's Army and not on some of my other projects, like Conjure Man, New York Soliloquies, and, oh, I don't know...actually doing the stuff that buys groceries. Yay! It turns out that when TWS was first published, the publisher purchased an ISBN (International Standard Book Number) for it. This is good news. It means the number is still there (978-1-61937-195-8, in case you were wondering) and favorable comments online in places like Amazon and BN.com are still tied to it. It also means that when I republish it, I can do so using my real name instead of my pen name...which I've decided is kind of pointless. 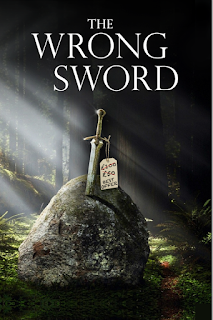 The New Cover for "The Wrong Sword"
The Last Coffee Update: French Press vs. Percolator - WHO WILL WIN?